DENVER, Colo., and TRENTON, N.J. — In preparation for an upcoming hearing in the U.S. District Court of Colorado, Robert Sutton, former Centrix Financial chairman and chief executive officer, and representatives from Everest National Insurance Co., and its related company, Everest Reinsurance, are slated to meet May 17 at the Denver courthouse for discussions concerning the upcoming legal battle. The Clerk's Office of the Colorado courthouse confirmed the meeting date this week. 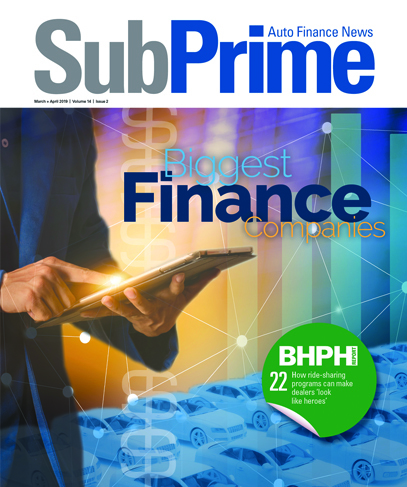 SubPrime Auto Finance News recently obtained the court documents involved with the Colorado suit and related suits pending in the U.S. District Court of New Jersey. According to the legal documents, a reinsurance company Sutton founded, Founders, and Everest are currently in arbitration over several matters in contention. Among other allegations, at the core of the disagreement is Centrix's Portfolio Management Program. Both parties agreed in court documents that under the program A-rated insurance companies were to provide Default Protection Insurance (DPI) and Vendor Single Interest (VSI) to credit unions, which were Centrix's primary clients before it received a Risk Alert and Documents of Resolution from the National Credit Union Association, which prohibited credit unions from participating in Centrix's PMP program. The actions taken by the NCUA resulted in Centrix filing for bankruptcy in 2006. Basically, if a subprime borrower defaulted on a loan and the vehicle is recovered, the DPI carrier was expected to pay the difference between the book value of the vehicle at the time of default and the outstanding amount of the loan. However, if the vehicle was not recovered within a certain period of time after the default, it would be considered a "skip" and the VSI carrier would pay the loss under its policy. Sutton and Everest agreed in the court documents that the VSI insurance lapsed; however, in contention is whether or not Everest knew this at the time it was paying claims. In the court documents, Sutton claims Everest was fully aware of the situation and "voluntarily" paid claims; however, Everest contends it was not aware, and the lack of VSI raised the company's exposure risk because it expected that insurance to kick in before the company's DPI insurance. Before going into business together, Sutton's company, Founders, agreed that it may be liable to Everest on a reinsurance basis if the number of claims on insurance policies written in an underwriting year exceeded 20 percent of all policies that year. Everest also had Sutton sign a personal guarantee to ensure Founders Reinsurance Agreement with Everest. In civil action No. 1:07-cv-425 in the New Jersey court, Sutton's attorneys contend that the legal dispute between the two companies began in early February of this year. "On Jan. 31, 2007, Everest unreasonably and in bad faith made a demand under purported Guaranty of Payment, dated July 2, 2003, between Everest and Sutton (personal guaranty) that Sutton pay more than $76 million into a Colorado bank account no later than 12 p.m. EST the very next day," the court document stated. "Consequently, Sutton filed a Compliant for Declaratory and Injunctive Relief in the Colorado state court on Feb. 1, 2007," the court case continued. In response to this Feb. 1 injunction, Everest filed lawsuits in the U.S. District Court of New Jersey over the personal guarantee Sutton signed. In the lawsuit filed March 14, among other contentions, Everest alleged, "In July 2005, defendants intentionally failed to disclose to Everest that they had allowed the VSI insurance, which has been provided by another insurance carrier, to lapse because Centrix failed to pay the VSI premiums. "Because the VSI insurance would have responded before Everest's DPI insurance in many instances, Everest's exposure risk was materially increased, thereby causing damage to Everest in excess of tens of millions of dollars," case No. 3:33-av-0001 contended. Moreover, the company alleged in its lawsuit, "Had Everest learned about the VSI fraud, Everest would have canceled its participation in Sutton's PMP and taken steps to mitigate its losses." In response to Everest's allegations in the New Jersey court, Sutton filed a motion to dismiss, stay or transfer the action back to the U.S. District Court of Colorado. Sutton's countersuit states, "The plaintiffs' most recent lawsuit relates to an agreement by the plaintiffs Everest National Insurance Co. and Everest Reinsurance Co. to provide insurance to entities with which the defendants were affiliates. Defendant Sutton indisputably filed the first lawsuit in Colorado relating to that agreement." Sutton's attorneys also noted that in relation to the arbitration proceedings going on between Everest and Founders, "a New York court has issued an injunction preventing Everest from taking any further money from Founders' trust account pending a resolution of the arbitration proceedings." His attorneys went on to argue in the motion, "Until those arbitration proceedings have concluded, and it has been determined whether Founders has any reinsurance obligations to Everest, it is impossible for any court to decide whether Sutton has any liability on the purported guaranty of those reinsurance obligations." Responding to Everest's contention that the company was unaware of the lapse in VSI coverage, Sutton's attorneys responded in their motion by alleging, "According to the latest Centrix underwriting standards approved in writing by Everest, all insured loans must have a VSI policy in force throughout the term of their coverage with Everest. "Centrix loans funded prior to July 1, 2005, lost this VSI coverage and thereafter it was not replaced. As a result, these loans no longer met the underwriting standards imposed by Everest and were properly excluded from the coverage provided by Everest," according to case No. 3: 07-cv-01236. "The Guaranty Agreements provide that Sutton and the Corporate Guarantors only guarantee the obligations of Founders under the Reinsurance Agreement, subject to the same limitation, exclusions and exceptions applicable to Founders. In addition, the Guaranty Agreements specifically provide that the guarantor that ‘may claim as a defense that Founders is not liable to the company under the Reinsurance Agreement, provided that such defense is predicated upon a claim that the losses ceded are not covered business under the Reinsurance Agreement, or are otherwise not yet due under such Reinsurance Agreement," Sutton's attorneys contended. "Upon information and belief, the defendant Everest voluntarily has been paying on loans that it knows did not meet its underwriting standards," Sutton's attorneys went on to allege. The Clerk's Office of the U.S. District Court of New Jersey told SubPrime Auto Finance News that Sutton's motion for dismissal, stay or transfer to Colorado has yet to be decided upon by the judge. SubPrime Auto Finance News contacted both Everest and Sutton. Neither was willing to comment on the record. Sutton is currently serving as CEO and chairman of Universal Special Auto Finance, which is a new company founded not long after Centrix filed for bankruptcy. He continues to be based near Denver, while Everest is a Delaware Corp., with its principal place of business located in Liberty Corner, N.J.